CBS, TV.com, Hulu - TV Everywhere! France experienced widespread growth in online video consumption during the past year, as audience size and video engagement both increased significantly. 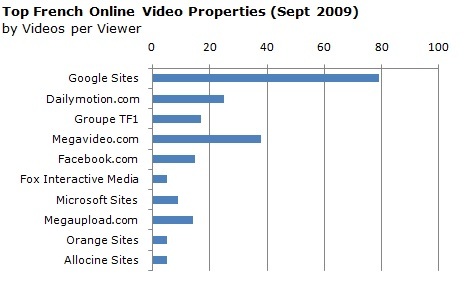 The number of online video viewers increased 36 percent to 34.6 million, while the number of videos viewed grew 141 percent to 5.4 billion. The average time spent viewing videos online during the course of the month nearly doubled to 11.7 hours per viewer in September. 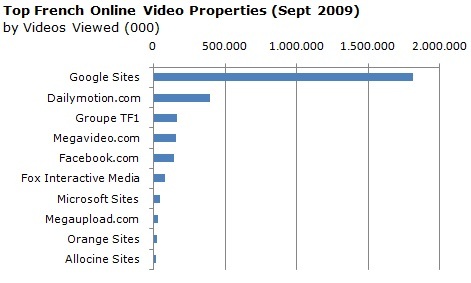 Driven by the popularity of YouTube.com (which accounted for 99 percent of all videos viewed on the property), Google Sites ranked as the top video content property in September with 22.9 million viewers and 1.8 billion total videos viewed, representing a 33.5-percent share of the French online video market. 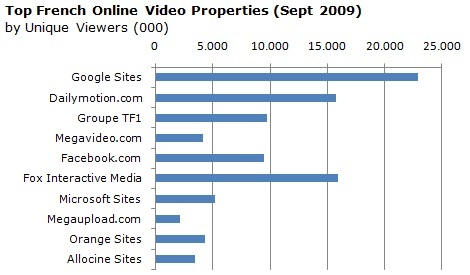 French video site Dailymotion.com ranked second with 394 million videos viewed, followed by Groupe TF1 (162 million videos), Megavideo.com (160 million videos), and Facebook.com (145 million videos).